Having contemplated seeing the sights around equestria outside of his home in the Velvet strand, Lockhart Thunder walked down the path out of his beloved home village. It felt a little bit strange for him, and he worried about being away from his herd. Lockhart had always dreamed of traveling around equestria, But he was always to fearful to leave his herd, anxious that something might befall of them while he is gone. Having talked about it for a long time to his Dear Autumn, She and a few other close Peryton finally managed to convince him that the herd would be just fine, and that a few other younger bucks were willing to fill his place for awhile, and that he should takes some time to relax and enjoy it. Having crossed the lakes, Lockhart headed down past Cloudsdale and into Ponyville. Trying to put the anxiousness of being away behind him The winged deer trotted over a hill looking over Ponyville. Stopping to rest for a moment on the path he gazed upon the town below. Looking in amazement at all the houses around. The Pony kinds homes where much different from that of his homeland which where all simple underground homes dug out of the hillside. These on the other hand where all above ground structures, with various features and designs. Some being more intricate than the other. Something that was totally new to someone with simple tastes like his kind. Walking into town Lockhart looked around at all the things to see. It was so much more busier than at home. Taking it all in The large winged deer trotted down the dirt paved street through town, a sweet smell trailing behind him. His magic was much weaker alone, but was still prevalent around him. As he wandered around looking for something to get into, he noticed all the ponies going about their business, and walking the streets like him. Lockhart had been used to being around ponies as his homeland was much visited by their kind for the Peryton's magic, But this felt different. Back home he was around his fellow Peryton. He was however the only one of his kind here, He felt out of place, exposed, He felt like he stuck out among all the other ponies and could be easily spotted from afar. Even being a large Peryton, Lockhart couldn't shake the thought in the back of his mind that he was vulnerable, and exposed. Taking a deep breath in and exhaling out, Lockhart tried to put his mind off of it as continued down the street gazing into the windows of shops as he passed by hoping to find something to occupy his mind and help him relax a little. Perhaps maybe he should visit one of the baked goods shops around to see what kind of cuisine the ponies liked. Lockhart thought to himself as he searched around for such a shop. he gave a bit of a nervous chuckle thinking about all the looks he might get walking into a shop. He knew the Peryton didn't get out much, and he figured it would come as a surprise to ponies to see one of his kind in Ponyville. He almost wandered if he was drawing attention even now, as he let his surrounding slip from his view as he searched for a shop to visit. Something that he wasn't much used to. Rivulet had left his mountain abode for the time being. As he was a cartographer the need to travel was dear to his heart. Nothing was more fascinating to him than experiencing a foreign land, with unknown cultures, and species to meet and learn from. The eastern dragon's body undulated through the skies, his deep blues and blacks standing out against the semi-clouded pale blue void above him. In the bag that was strapped just behind his front legs rested quill, parchment, compass, and all the other supplies a map maker could need. These would be for rough sketches and ideas, not for actual maps. No, those were made alone in his mountain home. One map would take him months of painstaking labor. It was meticulous work and Rivulet thrived off of it. Getting each and every detail down, keeping the scaling correct, adding artistic flourish where he deemed fit. Today he would be going back to an area that he knew quite well. He had been around more than once and had a chance to meet a variety of the populace. He knew of a certain bouncy pink pony in town that would certainly offer him something for his sweet tooth! Yes Pinkie Pie was a gem and he counted himself forever lucky to have met the mare. At first of course he had been standoffish, wanting little to do with her light hearted ways. But he knew an old dragon such as himself could be weighted down by life and a bit of frivolity would be just what he needed to keep his head on straight. 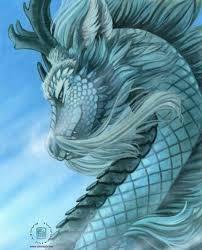 And so the eastern dragon wove his way down through the clouds to loft onto the road leading into Ponyville. He moved along, nodding kindly to those he passed. He had visited more than once so most ponies were aware that he was of the benign nature and certainly not planning on bringing fire of wrath upon them. As he moved further into town he happened upon a sweet scent. Something he had not experienced before. Could this be something new of Pinkie Pie's creation? He moved on to find that the smell was not coming from the home of the pink pony but from a winged deer that was poking around near the shops in town. Ah! Someone new to learn about perhaps? He made his way carefully up to the creature. A peryton if he remembered correctly. He had met one or two in his long days and found himself anxious to meet this one... he seemed quite different than the others he had encountered. "Hello there?" His voice had a deep booming effect though he tried to speak as softly as he could. The large dragon knew his appearance could be off putting to those who had not met him before. Lockhart had just started to let his guard down a bit, and relax a little, as he roamed on both sides of the streets curiously looking about the local shops. He had to admit it was nice not having to worry about the herd for awhile. Having noticed a sign for a bake goods shop down the street, Lockhart set off down the street towards the shop. Perhaps maybe he could use this chance to get to know some ponies, and find out what kind of foods they liked all at the same time. It was a rather beautiful day out he thought as he trotted down the street gazing at all the houses. Compared to the Peryton's home, the ponies sure had some nice houses, they seemed rather quaint in style. He knew they where nothing like the fabled Canterlot city which he had heard so much about from Canterlot residents which frequented his village which was a resort like town. Thinking of Canterlot that was another place he would love to visit sometime. He had heard so much about its grandeur, and it was the city which held the castle of the Princesses which ruled over Equestria. Admittedly Lockhart thunder had never seen the Princesses before, and wondered what they might look like. No doubt the Castle which they resided in must be large and grand in style. Setting that thought aside Lockhart thunder neared the shop which he had set eyes on, when from behind him there was a rather booming voice. Embarrassingly to him it had made him flinch just a little. Quickly turning his head around he looked to see where this voice was coming from, it was a dragon! He had never encountered a dragon before back in the Velvet strand. Hurrying to collect his thoughts and actions, it had seemed that this one was friendly. Relaxing his muscles he turned to face this dragon. "Um.. Hello there." The winged deer responded. "Whom might you be?" He asked curiously. Rivulet's continence fell for but a moment as the winged deer flinched. Though he tried there was really no way to lessen the effect of his deep booming voice. Once he got to know somepony he found that they had less and less reactions to his tone but first timers well...it really couldn't be helped. He was happy to see that at least he had not scared this specimen off. No quite the contrary, the big buck had turned to face him. That was indeed pleasing to the lanky dragon. The smells that curled around his sensitive nose enlivened his senses. Freshly baked breads, pies, cookies and the like combined with the sweet aroma that seemed to roll off the big deer were all but intoxicating. Rivulet shook his head causing the mane that ringed his face to wave about. He tried for a calm smile and then bowed his head ever so slightly in greeting. "My name is Rivulet," He nodded to the satchel that rested just in front of his forelegs. Parchment rolls could be seen protruding from the top. "I am a wandering cartographer and seeker of knowledge," He then cocked his head, inquiring of the peryton. "I have not seen one of your kind in long years," He sniffed lightly. "And never one with a magical aura as you seem to possess." Rivulet's sense of magic was keen as a razor edge. He had been in this world for time out of mind and thus had honed various senses. He sniffed again, this time his eyes diverting to the nearby shop. What a shop it was! Adorned with sweets and treats and bordered in icing. "Ahhhhh," His eyes twinkled. "Sugar Cube Corner. Have you had the pleasure my friend?" Calling the peryton friend was a bit presumptuous however the dragon tended to get along with most creatures and had decided this buck would be no different. "Perhaps I should add 'seeker of sweet treats' to my list of titles," He chuckled lightly at his musing. The dragon nodded as Lockheart spoke of his home on the Strand. "Yes I do know the Velvet Stand though it was long ago that I last ventured there." His mane continued to magically float about his face as he thought back. "The purifying magic of the peryton kept the land healthy at that time as I'm sure they still do now," The dragon's eyes widen at the mention of never being out of one's homeland. "It is good to meet you Lockheart Thunder." "Well then!" He walked a sinuous circle around his new friend while speaking. He was long enough that his head almost met his tail as he made his way around. "This is a momentous occasion indeed!" He nodded towards Sugar Cube Corner again. "We must stop by my favorite sweets establishment! There is much to celebrate for you in your first journey!" Rivulet was always enthusiastic about travelling and gaining wisdom through experiences abroad. "Come my friend! Let us find new adventures together!" Rivulet made his way to Pinkie Pie's place of work with a trot to his step. This would be so much fun! "Thank you come again!" Pinkie waved good bye to a customer and just as quickly greeted the next in line. "Hi! Welcome! What can I get for you!" The pink mare was a flurry of activity as always. The line for Sugar Cube Corner's counter was also as busy as ever! A bustle of ponies and other creatures crowded inside and down the steps. "This is where we wait my friend," Rivulet offered a position in line to the buck. "Lots of ponies and others enjoy what Pinkie Pie has to offer!" The pink one was so fast with her service that in a few moments Rivulet stepped into the shop itself. When her eyes met Rivulet's she couldn't help the huge grin... or the fact that she jumped over the counter, sending cupcakes flying and barreled towards her old friend. "Oh my gosh!" "Ha ha! Pinkie Pie!" Rivulet chortled as Ponk met him in a huge hug. Then a cupcake hit him between his horns, frosting first of course... "I've traveled far to get here and the treats are already flying..." He raised his head and caught another falling cupcake in his jaws. Sharp teeth flashed for just a moment, reminding anypony that saw them that this really was a dragon! But most knew he was friendly and those that didn't were quickly clued in. "Mmmmmmmm," He sighed as the sweet confection melted in his mouth. "I do love a good..." He tipped his head, thinking. "Cupcake!" "That's right! You want your favorite order I assume?" Before Rivulet could answer Pinkie noticed Lockheart. "Hi!" She bounced right over to the peryton and grinned broadly. "I'm Pinkie Pie!" It came to no surprise to Lockhart that Rivulet had been to the velvet strand before. Being the map making dragon he was. "Likewise." The winged deer replied to the greeting. Watching as the dragon circled around him, almost complexly surrounding him. Trotting along behind the dragon Lockhart followed him to Sugar Cube corner. He had been on his way there before he met the dragon. Coming upon the business it seemed the place was busy enough . Ponies where coming in and out of the shop in an almost constant stream. After a few moments They where in the shop themselves. A sweet aroma mixed with that of Lockhart's upon entering. He had been most curious what kind of sweets this shop sold. A pink pony was found behind the counter running the place. With a sudden flash The pink mare bolted over the counter to meet Rivulet. Sending dozens of confections through the air. Two of them landing on Rivulet. Ducking a little briefly, The winged deer hadn't noticed any land on him. Smiling a little as the pink mare bounced over to him. Opening his mouth to introduce himself he was cut short by the dragon which had already introduced him. "Hello. Its nice to meet you Pinkie Pie." Lockhart smiled looking at the bouncy pony. "My name is Lockhart Thunder." He felt the need to introduce himself even tho the dragon already had. "I come all the way from the Velvet Strand. This is my first time being out of my homeland. Lockhart explained to Pinkie. "You pony kind sure have different tastes from that of my kind." He said gesturing to himself as he glanced around the room. As Rivulet looked over it would appear that the winged deer had two cupcakes stuck one on the tip of each of his large antlers. His antlers being attached to his head Lockhart couldn't see them even if he looked up. Glancing up with his green eyes he could just see them stuck up there. How was he going to get them down? "Well then I can't wait to introduce you to the things that ponies like to eat!" Pinkie answered a boisterous answer to the magic deer's statement. "What do your kind enjoy? I've never had tea with winged deer, or brunch, or ever a snack!" 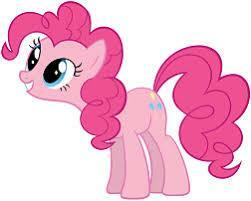 Pinkie bounces up and down around the room and then back to Lockheart. "Oh my gosh! Those look good on you!" She bounced up, tipped them off his antlers with a hoof, and gobbled them up before anypony had time to blink! "But they taste better than they look!" "Heh heh heh..." Rivulet chuckled dryly at the antics of his pink ponk friend. She certainly made him feel at least a hundred years younger. "So about my usual?" He eyed Pinkie with smile on his muzzle. "Oh yeah!" Pinkie bounced back behind the counter. She was back up in flash, pointing towards the bar stools nearby. "You two take a seat and I'll fix you up the special of the house!" Rivulet glanced at Lockheart. "You ready to try pony sweets my friend?" She grinned. "Because nothing is sweeter than what sh'e about to serve us..."
As if on cue the room filled with a distinctly sugary smell, cotton candy, fizzy soda, and bubble gum were just a few of the fragrances. Pinky giggled as she put a bowl full of what looked like bubbles onto the counter. "Sugar bubbles!" Pinkie couldn't help but grin! "Get poppin' Rivulet!" The dragon took his front claws and as daintily as he could moved a blue bubble out of the bowl. It floated in front of him and he chomped down! "MMMmmmmmm..." He sat back, savoring the flavor. Lockhart Thunder smiled at Pinkie pies enthusiasm. "Well us Peryton have somewhat simple tastes. I for one enjoy tea and bread, but I can't say i have ever had any sweets yet." The winged deer said chuckling at pinkie pie as she bounced up to tip the cupcakes off of his antlers. Walking over and taking a seat at one of the nearby stools, He watched in the direction that Pinkie pie went in curiosity as sweet aromas filled the air. "I guess I'm ready as i will ever be." He said with a grin glancing over to his new acquaintance . In a flash Pinkie pie was back with a bowl full of some kind of sugar candy. To say the least He had never seen anything like it. Looking at it curiously with his green eyes for a moment as Rivulet took one, He picked one up looking at it closely before taking a nibble of it. the sugar rapidly melted in his mouth as he eat it. Its sweet flavor was like nothing he ever had before. To tell the truth he very much liked it. He was rather much curious what else the ponies like to eat now. "These are very good." he said with a bit of a grin as he nibbled at it some more.